Châteauroux and Alsace would be fighting over the creation of a Tesla factory… Naturally, we think of the brand and its cars… As a company head myself, I can only dream of the company choosing Alsace! Obviously, all arguments should be considered and conveyed by the networks and their channels to the CEO of the Group, Elon Musk. I’m not talking about Tesla Motors, but about Nikola Tesla, the engineer whom the company is named after. Who remembers now that Tesla refused the Nobel Price so he didn’t have to share it with Thomas Edison? A man with such character must naturally have appreciated the character of Alsace, this region, go-between of France and Germany, crossroads of a symbolic current, which today deserves to welcome this European Tesla factory. May many people convey this history to the decision makers at Tesla Motors… It creates a real link between Tesla and Alsace, and gives real meaning to the choice of Alsace for them… A reference to History? A never-ending story, actually… Wouldn’t it be pleasant, symbolic and amusing to write the next page of this story today? Stéphane BOURHIS teaches at the Université de Strasbourg where he is dedicated to convey to his students, as well as to the Red-Act customers, the means to be independent, impactful and efficient. As a Member and Regional Representative for the APCIG (professional association of the reporters and informers of gastronomy and wine), he deeply cares about supporting professionals from the tourism, gastronomy, hospitality and restoration industry in their day-to-day communication. 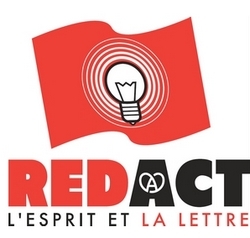 Founded in 2004, Red-Act agency chose to specialise in print and digital communication, in the conception-writing and production of added-value content. It developed strategies related to brand imaging and social media management.